List of official websites for RRB Group D admit card and RRB Group D Admit Card To Be Available September 13 Onwards: RRB Group D Posts Recruitment 2018, Important instructions, Steps to fill the online application form and link, RRB Recruitment 2018 Group D Posts: Railway Recruitment Board, RRB has released the recruitment notice CEN 02/2018 for filling 62,907 Group D posts across regional RRBs. The application process live on February 10, 2018, and it would be available until March 12, 2018. Candidates in the age group of 18 – 31 years of age that meet the educational qualifications are eligible to apply for the posts. Here are important instructions and steps for filling the online application form for RRB Group D recruitment 2018. RRB Group D Admit Cards 2018: Railway Recruitment Board (RRB) is conducting exams to fill up 62,907 posts of Group D staffs across the nation. The examination which was started from September 17, 2018, will end on December 17, 2018. The admit card for each examination is released four days prior to the exam. Candidates who will appear for the examination in the coming days can check the steps to download the admit card given below. Step 1: Candidates have to visit the official site of RRB at rrb.gov.in or can directly visit the regional RRB site to avoid time. Step 2: The home page of the website has ‘CEN-02/2018’ flashing on it. Step 3: Click on the link and enter your user id and registration number and password or the date of birth. Step 4: Check the exam city, the examination date and then click on submit to download the admit card. Step 5: Once the admit card is downloaded, candidates can keep a hard copy of the same for further reference. The examination will be conducted to fill up Track Maintainer, Gateman, Pointsman, Helper in Electrical / Mechanical / Engineering / Signal & Telecommunication departments, Porters and some other posts in Indian Railways. The examination will be conducted for a span of 51 days. Candidates can check the official site of RRB to get more details. Railway Recruitment Board, RRB has released the Group D Admit Card for October 22, 2018 CBT on the official websites of rrbmumbai.gov.in, rrbchennai.gov.in, etc. Candidates who have applied for the examination and whose RRB Group D First Stage CBT is scheduled for October 22 can now download the admit cards from the direct links provided below. Group D Admit card download link and schedule for October 22 to October 26 examination is provided here. Check Group D Exam Date, City and updates for CBT scheduled after October 29. Please note that the admit cards would be released only 4 days ahead of the examination. Candidates whose RRB Group D exam is scheduled for October 24 would be able to download their admit card from the given link only after October 20, 2018. Also, the exam dates and city for RRB Group D Examinations scheduled after October 26, 2018 would be released tomorrow. The admit card for October 16, 2018 RRB Group D Exam would be released on September 30, 3018. Candidates may download the hall ticket from the official website. The date of exam, city, centre would be made available to the students on the admit card. The Railway Recruitment Board would be releasing the admit cards on September 30, 2018 for only those candidates whose computer-based exam is scheduled for October 16, 2018. Students may download the admit card from various RRB websites such as- RRB Ahmedabad, RRB Ajmer, RRB Allahabad, RRB Bangalore, RRB Bhopal, RRB Bhubaneshwar, RRB Bilaspur, RRB Chandigarh, RRB Chennai, RRB Gorakhpur, RRB Guwahati, RRB Jammu, RRB Kolkata, RRB Malda, RRB Mumbai, RRB Muzaffarpur, RRB Patna, RRB Ranchi, RRB Secunderabad, RRB Siliguri and RRB Trivendrum/ Thiruvananthapuram. RRB Group D Admit Card, Exam Date, Shift Details: Railway Recruitment Board or RRB of Indian Railways has released more examination details of candidates whose RRB Group exam date, admit card and other details have not been released online. Now, the RRBs have released examination information for candidates whose exam shifts have been scheduled till October 26, 2018. An update available on RRB website on RRB Group D exam also said the next schedule of exam city and date intimation for the exam starting from October 29, 2018 will be made live on October 18, 2018. The Board have uploaded RRB Group D admit card for the exams scheduled till next five days including from 06-10-2018. The applicants have also been sent exam date and shift details to the registered contact numbers. Candidates, Please note - The Exam City and Date information is live for candidates scheduled from 17.09.2018 to 16.10.2018 For all remaining candidates the details will be live from 30.09.2018 onwards. RRB Group D Admit card 2018: Candidates need to visit the official website to download RRB Group D Admit card for October 16 Exam. Click on the links provided above to dowload the hall ticket. Click on 'Download RRB Group D admit card' on the homepage. Enter the roll number, name and other details. Press Submit and take a print out of the Admit card. The candidates who have applied for the Railway Recruitment Board (RRB) Group D examination 2018 can visit the official website of RRB to download the admit card. The admit cards are now available on the official website of the RRB for candidates whose examinations have been scheduled till September 27, 2018. The RRB uploads the admit card for candidates four days ahead of the scheduled examination. The link of admit cards will be available on various websites of the RRB. RRB will release the exam city, date and shift intimation for candidates whose exams are scheduled till October 16, 2018, on September 30. The Level 1 Computer Based Test (CBT) for RRB Group D recruitment will be held till December 14, 2018. Candidates who have filled the forms would be required to download the RRB Group D Admit Card from the respective regional websites. As per the practice, RRB Group D Admit Card download are expected to begin from .... Also, RRB Thiruvananthapuram has released an important notice regarding the Group D admit card download on rrbthiruvananthapuram.gov.in. Candidates who have applied for RRB Group D Recruitment 2018 under the CEN 02/2018 are advised to note that the exam date, admit card and exam city information would be released on various regional websites on September 30. Candidates are advised to keep a check on the official regional websites and attempt a download once instructed. Candidates would be informed about the Exam Date and City from 30 onwards. The First Stage CBT is tentatively expected to begin from October 16. Admit Card download information would also be released on September 30. RBs have confirmed the group D exam date and admit cards for the same will be available 10 days before the date. The RRB group D admit cards will be available on the official websites of the railway recruitment boards (RRBs) as and when they are uploaded. Respective RRBs will intimate candidates about the group D admit card date through SMS and emails. Candidates are therefore suggested to check their inbox everyday for timely updates. Considering the rising search for RRB group exam date online, RRBs have requested candidates not to believe fake news about the exam date and admit card release. RRBs have released the admit cards for Group D exam to be conducted on September 17, 2018. The download link for the RRB Call Letters is available on all the regional RRB websites. Candidates who will appear for the exam on October 16 should download their admit card now. After downloading, a candidate must check the details mentioned on their hall tickets. In case you are not able to download the admit card or any discrepancy in downloading your admit card, the Railway Recruitment Boards or RRBs have activated a link in all the websites of all the boards to seek help from the help desk. RRB Group D Admit card will have the following details: Candidate's Name, Candidate's Registration Number, Candidate's Roll Number, Exam Date, Shift Reporting Time, Exam Centre Name and Address, Nearest Landmark for Exam Centre, Candidate's Photograph, and Candidate's Signature. Step I: Go to official RRB website. Step II: Click on the link provided for First CBT- Helpdesk. Step III: Enter your user id and date of birth. Step IV: Login and submit your query. RRB Group D CBT or Computer Based Test will be held in various shifts for more than 1 crore candidates from next week. The examination will be held in various examination centres across the country. Duration of the RRB Group D examination will of 90 minutes for 100 objective type questions. A mock test link has been activated to get yourself accustomed with RRB Group D exam. Four options are given to each question out of which only one will be the correct answer. There will be negative marking for wrong answers. 1/3rd mark will be deducted for every wrong answer.RRBs are expected to release the examination details today for the candidates who have not received the same on last Sunday. Concerned candidates will receive group D exam date and admit card information on their registered phone number and email address. RRB Group D Exam 2018 and Other Updates : Mock test link will be activated from September 10, a day after candidates receive their exam details. Registered candidates will be intimated about their exam venue, shift/ session and exam date on September 9; details can be found online by logging to the registration portal. Candidates belonging to SC/ ST categories can download the train travel authority on September 10. 'Candidates should read the instructions on the e-call letter carefully and follow them scrupulously. Failure to comply with the instructions may lead to cancellation of their candidature,' reads the official job notification. Admit cards must be carried to the exam hall along with valid photo ID like Voter Card, Aadhaar Card, printout of eAadhaar, Driving License, PAN card, Passport, Identity Card issued by the employer in case the candidate is a Govt. Employee, School / College / University Photo ID card. Download of E-Call letter: 4 days prior to the CBT date of the candidate. Section wise marks for Computer Based Test (CBT): The section wise marks for various parts of the syllabus for the CBT is furnished below for information of the candidates. RRB Group D Posts Recruitment 2018 - Exam dates: RRB Group D Recruitment Date Announced; Exam Likely to Begin From September 17: The wait for the RRB Group D exam date is finally over. The Railway Recruitment Board (RRB) has issued a notification announcing that Computer Based Tests (CBT) for recruitment of Level 1, Group D posts (CEN 02/2018) is likely to start from October 16 According to a statement posted on the official website of RRBs, the CBT for about 63,000 posts of Level-1 for jobs like Track Maintainers, Assistant Pointsmen etc., (erstwhile Group-D) will be held from October 16, 2018. The board will release the exam city, date and shift details 10 prior to the start of computer based test. Detailed CBT schedule shall be released shortly. The board is currently conducting the Group C (ALP and Technician) first stage examination for 66,502 posts. After the release of Group D admit cards , the candidates have to log in using their registration number and download the call letters. The admit card carries important details like name, exam centre and time. RRB has already started ALP exams and its admit cards are available for the next day of the examinations on the official website of RRBs. The Computer Based Tests (CBT) for recruitment of Level 1 posts is likely to start from 16-10-2018. The Exam City, Date and shift details shall be made live 10 days prior to the start of CBT. Detailed CBT schedule shall be released shortly. Important: Refer to only official websites of RRBs for all the recruitment related information and do not fall prey to the false messages circulated on the internet and social media. Further beware of touts and job racketeers as RRBs recruits candidates only on merit and shortlisted candidates for all stages till the recommendation for appointment shall be published on the official websites of RRBs only. Before applying, all candidates are advised to carefully go through the detailed centralised employment notification or CEN. Candidates should check the list of detailed vacancies in various RRBs to match the vacancy to their respective qualification in that RRB before applying. Please note, once the RRB has been selected and registration is completed, change of RRB will not be permitted under any circumstances. Also, candidates should ensure that they have all the required documents ready before starting the online application. The list of documents required is given below. 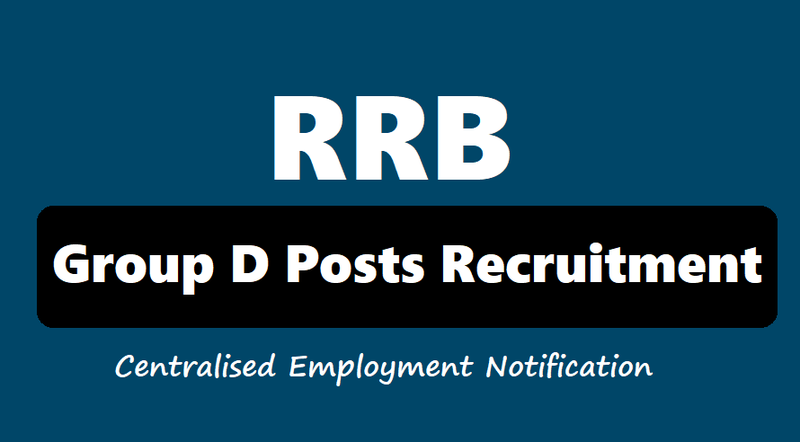 Related News | RRB Recruitment 2018 notice for 62,907 Group D posts out now! Check how to apply, eligibility, important dates. Category or SC/ST Certificate for candidates seeking a free travel pass for the purpose of examination. Please note, general category candidates would not be provided with this facility. The category certificate should be in JPEG image format of size 50 to 100 KB. PDF document is not to be uploaded. For candidates desirous of applying for the facility of a scribe, Scribe Photograph in color JPEG image format of size 20 to 50KB is also required.